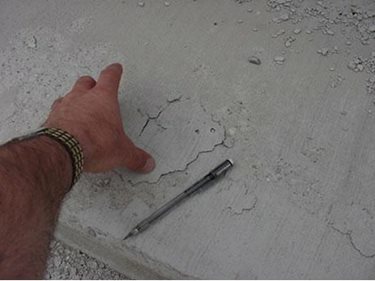 Delaminations in concrete slabs can be a serious problem, but often they are "heard" before they are seen. Here's an example. A concrete floor slab placed days ago has hardened and cured. As work from other trades continues in the area, someone drops a hammer from a ladder onto the floor, and an unexpected sound is heard. Instead of the clear ringing sound you would expect when metal hits solid concrete, a drummy sound or loud clack draws your attention. Using the hammer to tap around this spot, you identify more hollow-sounding areas. What's been discovered is a surface delamination in the concrete floor. When fresh concrete is placed and compacted, the solids (cement and aggregate) settle. This natural settlement causes excess mix water and entrapped air to be displaced (called bleeding), and the lighter materials migrate toward the surface. 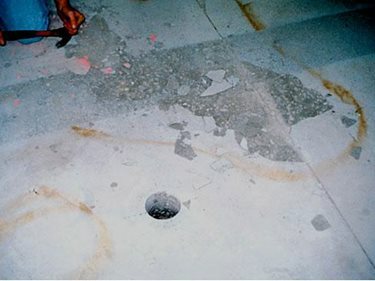 If finishing operations start prematurely and close or seal the surface before bleeding is completed, air and/or water are trapped under the densified surface mortar. As concrete hardens, subsurface voids develop where the water or air is trapped. These voids create weakened zones right below the surface that can eventually detach during slab use. Very thin mortar layers over delaminations may even detach when struck with a hammer, as you try to sound out the extent of the delaminated area. Photo 2 - Slab placed on waterproofing membrane on roof slab. Premature finishing resulted in widespread delamination. Delaminations come in various forms and degrees of severity. Blisters are small, isolated delaminations usually 1 to 3 inches in diameter (Photo 1). Blisters frequently happen when relatively sticky mixes with higher percentages of fines are placed. They occur in areas subject to moderate to high rates of evaporation and that are finished too soon. 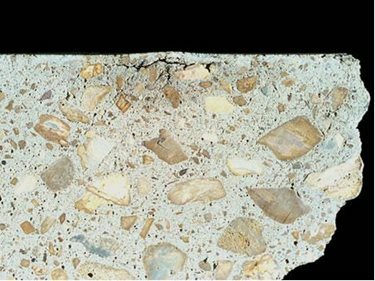 When finishing operations occur too early, uniformly over the slab, a delamination problem can be quite widespread and affect larger zones of a slab surface (Photos 2 and 3). Photo 3 - The thickness or depth of a delamination can vary, depending on the mix and the timing of final finishing. Here the depth of delamination is about 1/8 to 1/4 inch. When concrete is placed on an impervious subbase, bleed water must rise to the top because it can't exit out of the slab bottom. 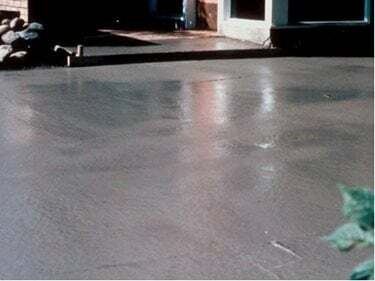 Compared to slabs cast on a porous subbase, the bleed water quantity will be greater and bleed time may be longer, especially in cold weather. Don't place concrete on cold subgrades when ground temperatures are below 40°F. If drummy-sounding areas on a slab are easily detectable by hammer or chain dragging, the subsurface probably contains voids. Depending on their severity and slab use (such as exposure to wheel loads and heavy traffic), these zones are likely to detach sooner than from a sound surface. 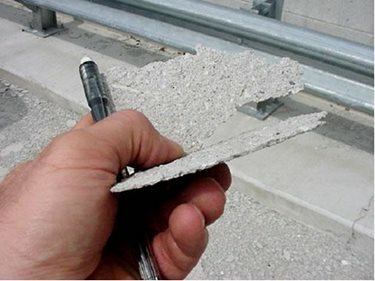 To achieve a high-quality surface, remove the defective concrete to a depth where only sound concrete remains. 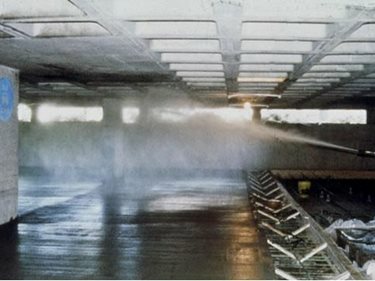 Proper removal of unsound concrete by suitable methods such as shotblasting (Photo 6), grinding, or hydrodemolition, is critical if subsequent steps are to be successful.